Kippered herring is a truly misunderstood, underutilized ingredient in the modern kitchen (outside of Scotland, I guess). The more I read about heart healthy foods, and about sustainable sources of omega 3s, the more I realize I need to eat more small fish. Apparently, small fish like anchovies, herring, etc. are a better source of omega 3s, and they are more sustainable. I like kippered herring. I can remember discovering it when I was little and watched my dad eat sardines on saltine crackers with mustard. My dad loved all kinds of smoked fish. Of course, it wasn't until I was older and my palate become a bit more sophisticated, that I really got into smoked fish. Fast forward to earlier this morning. I was having a phone conversation with one of my best friends, Lizard. She was telling me about some of the stuff her brother found in her parents' pantry earlier in the week. Two tins of kippered herring appeared on the shelves. Her father had been a fan. The tins ended up coming home with her. We were discussing what to do with said kippered herring, when I remembered a while back, I watched a "Good Eats" episode where Alton Brown mixed kippered herring (or maybe sardines) with avocado. The little squirrel-driven wheels in the back of my head began turning...and an idea was born....KIPPERMOLE! I began by searching for the tin of kippered herring I was sure was in my pantry. After that was secured, I sought out the on-its-way-to-overripe avocado I kept on my counter. A quick survey of the contents of the produce drawer of my icebox turned up one lonely, wilted scallion, the end of an English cucumber, and a lime. Now that was a list of ingredients I could work with! I took the kippered herring out of the tin, drained it briefly and threw it in my small work bowl. 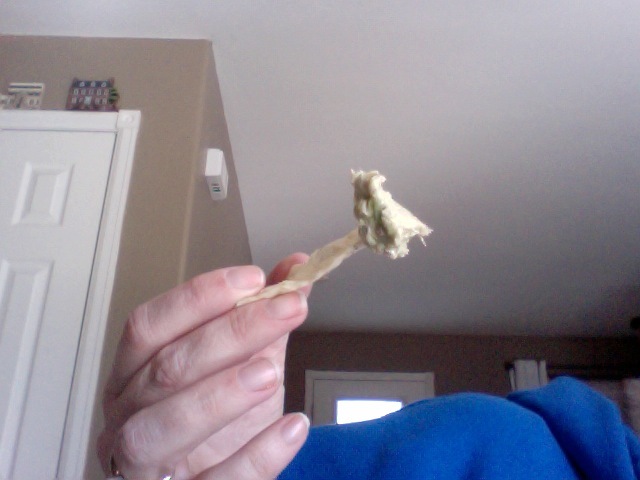 I halved the avocado, removed the pit and scooped the flesh into the bowl as well. I snipped the scallion in with my kitchen shears and chopped in the cucumber. I finished it by juicing the lime, adding a tablespoon or two of Greek yogurt and a good dash of kosher salt. All I needed now was some tortilla chips. The results are far from beautiful, but oh my- it is tasty. Addictive is actually a better word. And really, it's not a terrible snack. I'm not sure that I'd call it healthy (after adding the tortilla chips), but if you served it on cucumber rounds or something, it wouldn't be half bad. Even if you don't think you like smoke fish- I urge you to give kippered herring a try. Who knows? You might even develop an addiction to something that's good for you!